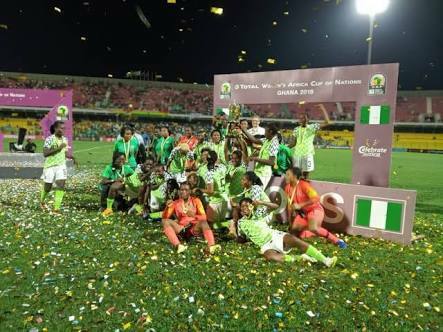 -How Super Falcons Set New Record By Winning 9th AWCON. South Africa following a goalless 120–minute attrition in Accra on Saturday night. The Super Falcons played a clever, controlled game at the Accra Sports Stadium and certainly looked quite impressive. Goalkeeper Tochukwu Oluehi was the heroine as she saved one kick in the shootouts. Heading to the final Nigeria won nine, drew one and lost two games. The Super Falcons gave Banyana Banyana all sorts of problems with their quick passing system in the opening 20 minutes. South Africa goalkeeper Kalyin Swart dived low to save a goal bound grounder from Ngozi Sonia Okobi in the 23rd minute. Seven minutes before half time, Francisca Ordega skillfully beat her marker before sending a poor cross to the box. In the second half, South Africa were more purposeful in their approach to the game. But it was Nigeria that had the chance to pull ahead after a goal bound Ordega was brought down in the box by goalkeeper Swart. 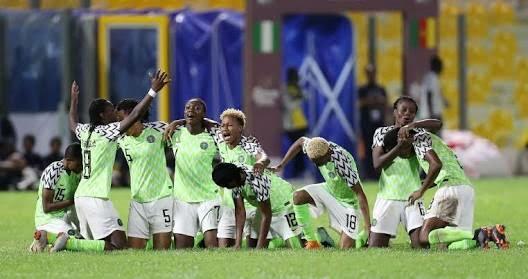 Oshoala failed to score from the penalty spot as the game dragged to extra time. In the fourth minute of extra time, Oshoala out muscled two defenders before sending a low drive which was well dealt with by Swart. Striker Chrestinah Kgatlana went on a solo run in the 98th minute after beating Onome Ebi and Rita Chikwelu for pace. Her weak effort was saved by Oluehi. South Africa continued to look dangerous on the counter. Linda Motlhalo had a well whipped shot well taken by the agile Oluehi.